I know it’s completely unprecedented in my profession, but I’m a big fan of gaming. When I’m not looking down my nose at console gamers, I can be found with zero or more people, huddled around a tabletop game. 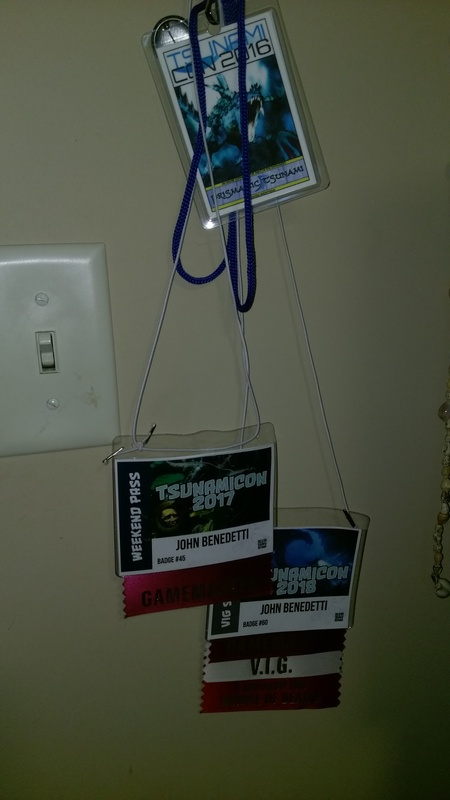 And as I’ve done for the past three years, I had the pleasure of attending TsunamiCon 2018. Shadowrun Missions : Welcome to the Sixth World – Shadowrun is a dystopian near future science fantasy setting. Basically, if you took Gibson’s Sprawl setting and added magic and fantasy races like elves and orcs. That’s Shadowrun. Shadowrun Missions is the organized play version intended for individual players to show up for a one-off adventure. Our host walked us through a (challenging) character creation before throwing us into the streets of Seattle. Can’t wait to try the setting again. Liberty or Death : The American Insurrection – I grew up on Avalon Hill wargames, meaning lots of cardboard counters and poring over dense rulebooks with ubiquitous reference numbers. GMT’s CounterInsurgency (COIN) series definitely scratches that itch for me. Liberty or Death allows players to choose a faction within the conflict to wrest the American colonies from British rule. Rather than simplify the conflict to being an isolated series of battles between Redcoats and Colonials, this game expands on the historical place of the American Revolution as just another theater in the global conflict between great powers like Britain and France. Eschaton – This was an interesting deck builder with area control elements. Players take control of a cultist faction struggling for control over minions and against each other with an eye toward ultimate dominance. Great way to end the day. Pixel Tactics – A good friend of ours hosted a tournament for this game last year, which I’m proud to say my son won all on his own. 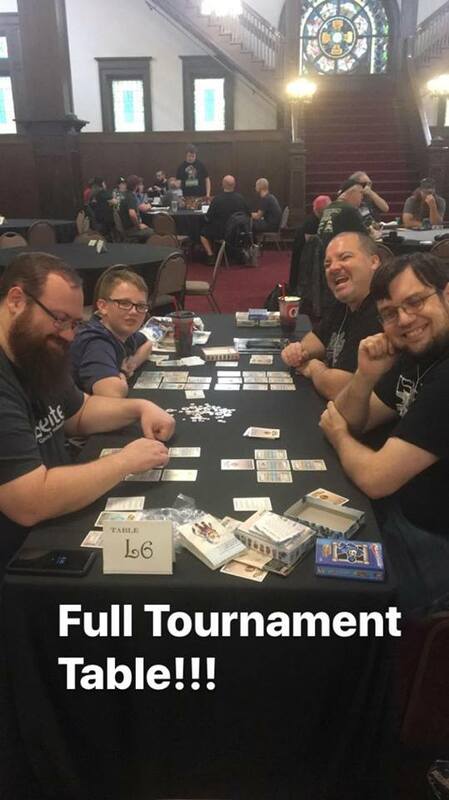 This game merited another tournament this year with promises of even greater glory and prizes, some supplied by the game publisher themselves! Players have a single leader that guides various ranks of heroes in battle against their rivals. Simple stats are buffed by intricate and seemingly limitless combos based on their position on the field and their proximity to the leader or other heroes. Arthur, Queen of the Britons! Mounting Pitons to Hold the Grill – ‘Tim the Enchanter’ is a regular fixture at TsunamiCon. This time, we ran into him while my daughter was exploring the con and noticed several distinctive props for an upcoming LARP game, based not-so-loosely on Monty Python and the Holy Grail. 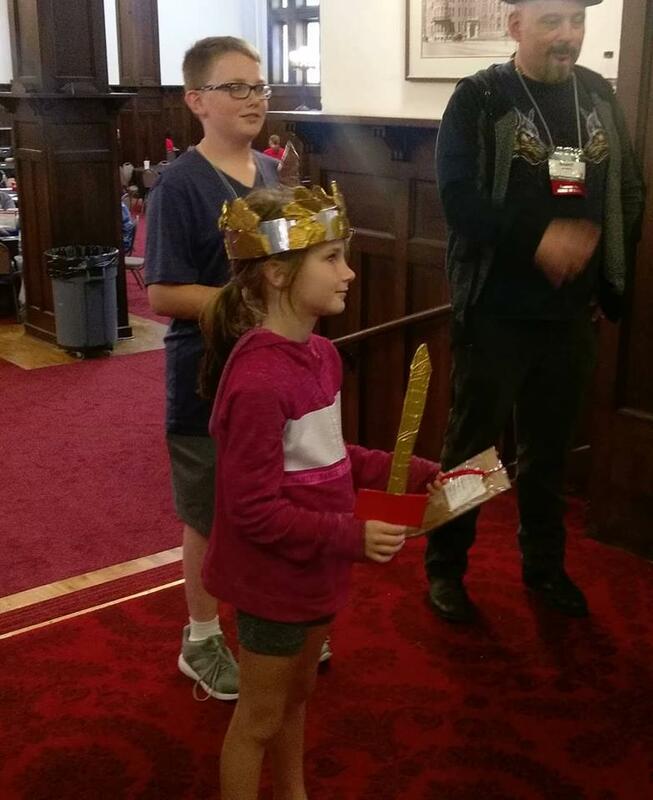 After Tim regaled her with promises of high adventure and treacherous challenges, Queen Arthur took up the quest for the Holy Grail, leading her Knights of the Round Table to ultimate antics and silly success! Ethnos – In Ethnos, players call upon the support of giants, merfolk, halflings, minotaurs, and other fantasy tribes to help them gain control of the land. This is another one that doesn’t make it to the table at home very often and we were delighted to have a full table. The game seems like there should be much to it as it largely consists of card draws and playing sets. The fun and intrigue crops its head up when players time their plays in attempts to gain the upper hand before the end of the round. Lots of stare downs and trash talk at this one. Pathfinder Society : Trial By Machine – Pathfinder Society is the organized play version of the Pathfinder fantasy setting. This was a chance for players of any skill level to try out the game and meet other players in a one off adventure, and let me test my GM skills on a new set of victims in the process. Free Play – Even for the most fanatical of gaming enthusiasts, cons invariably take a toll. My family and I had hit the wall by Sunday morning but we braved the floor again for some pick up card games and to say goodbye to old and new friends. As exhausting as it was, it won’t take long before each of us is brimming with ideas and counting the days until next time.